This delightful Etui (pronounced Ay-twee) is 13 x 13 x 13 cm (5 inches) and is ideal for carrying and storing your stitching necessities. 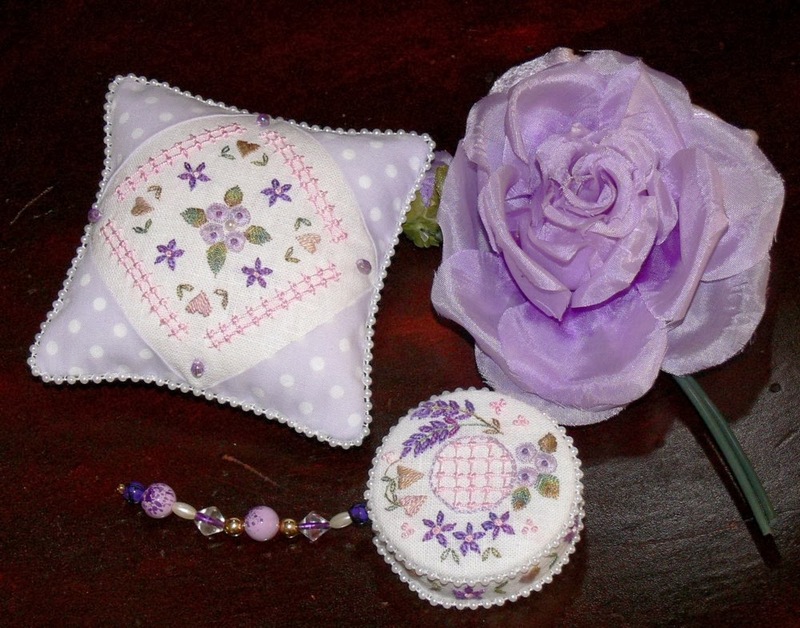 It opens out to reveal pockets for your bits and pieces and a heart pincushion for pins and needles. It is beautifully embellished with grub Roses and Baby's Breath embroidery. This gorgeous sewing folder is such a pretty and practical project. 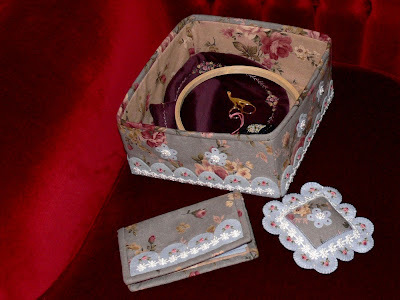 It measures 19 x 26.5 cm (7.5 x 10.5) inches and opens up to reveal pockets for your stitching accessories, tape measure holder, scissor tie, pen and pencil loops and felt for your pins and needles. 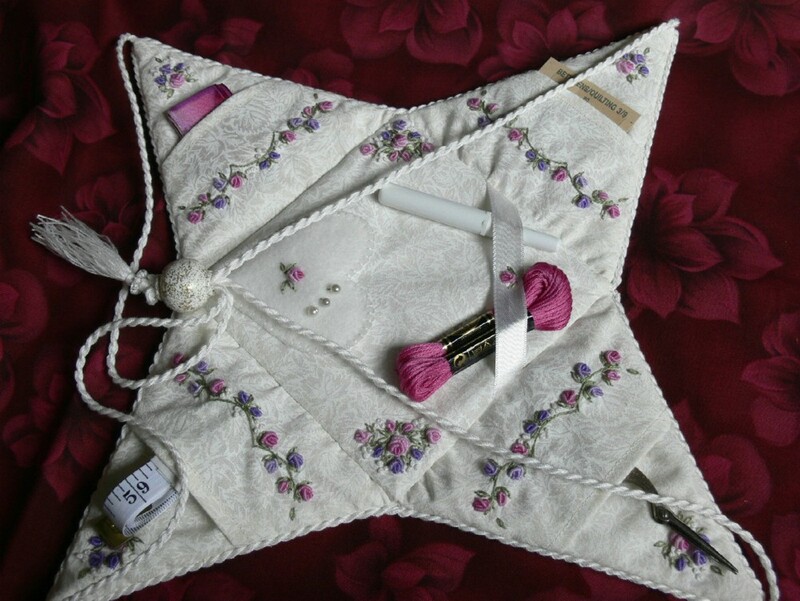 Handkerchief linen, luxurious beads and beautiful silk ribbons combine to make this stunning set. 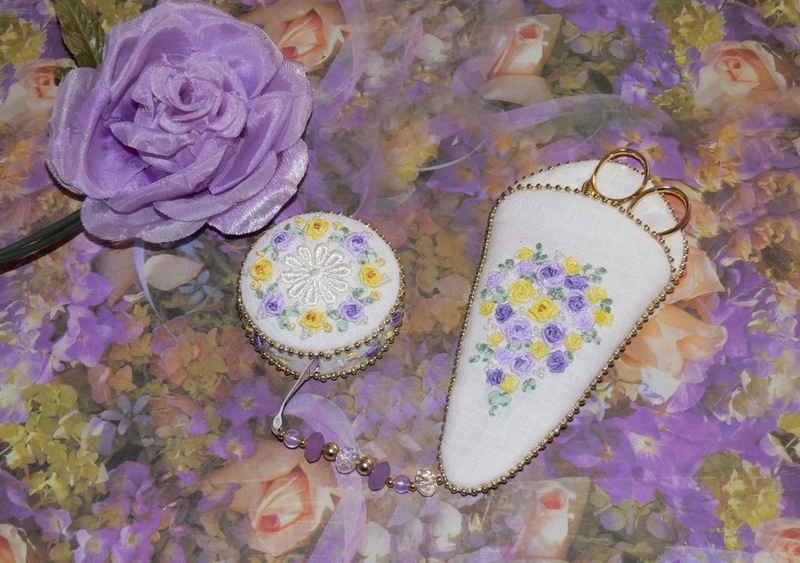 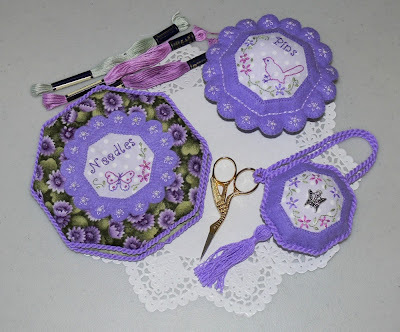 Imagine having these gorgeous items in your stitching basket! 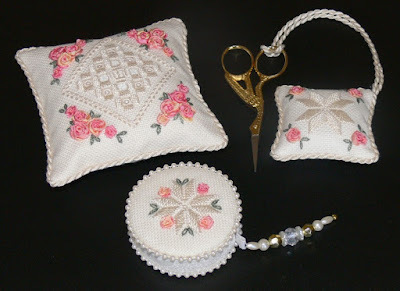 The Scissor case measures 8 x 15 cm (3 x 6 inches) and the Tape Measure 6 cm (2¼ inches) diameter. 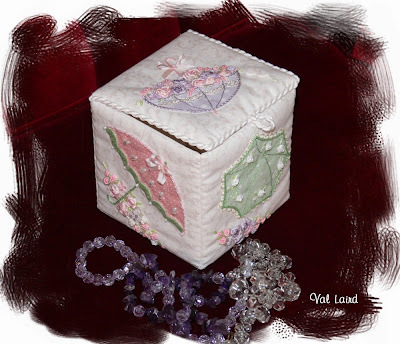 Gorgeous floral umbrellas decorate this 10 cm (4 inches) square box in which to keep your tiny treasures. 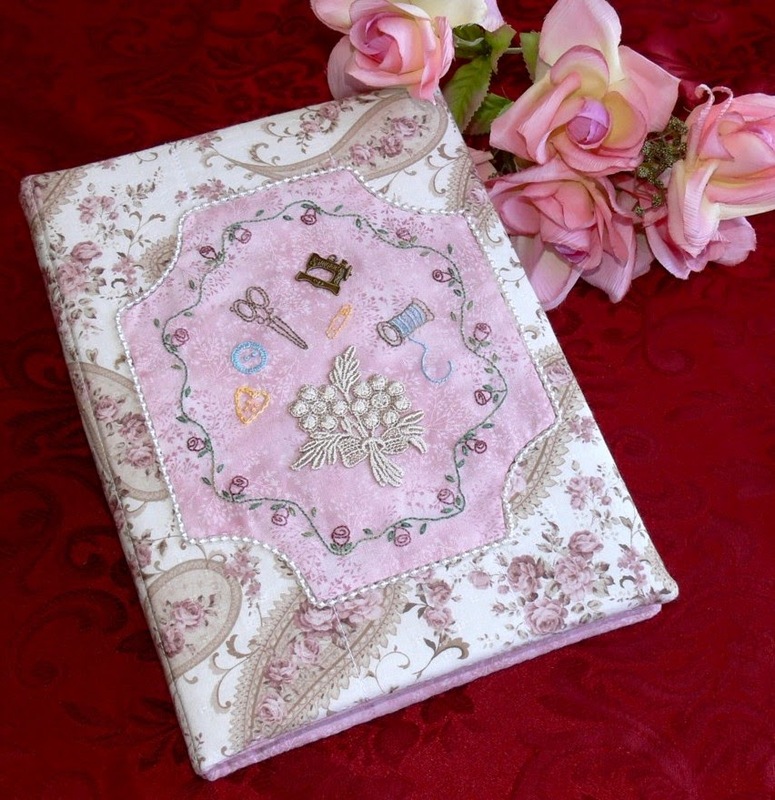 Silk Ribbon and grub roses flow from delightful appliqued umbrellas, embellished with an array of pretty stitches. 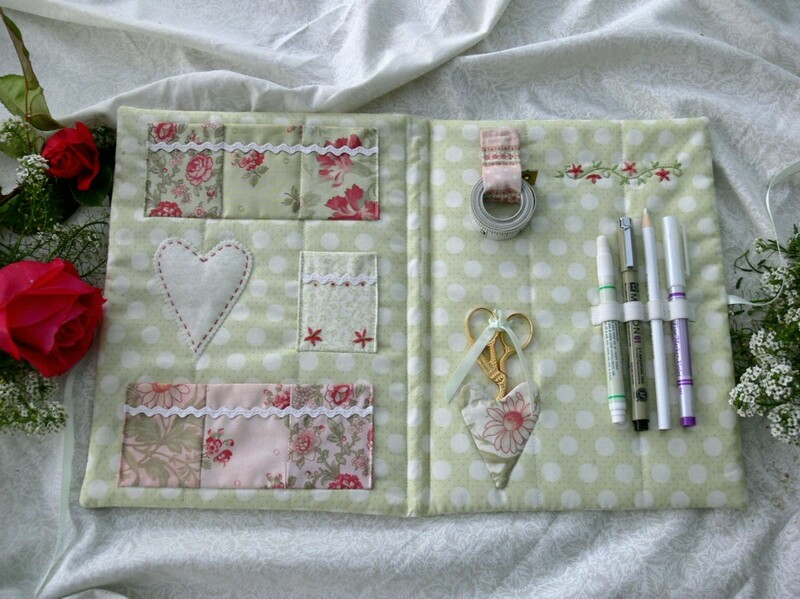 This very useful A4 compendium will carry all your bits and pieces to your craft group or even just keep everything in order at home! 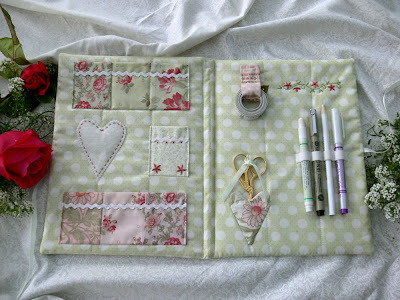 It has eight pockets for such things as threads, scissors and buttons, loops for five pens and a felt heart for your loose pins and needles. 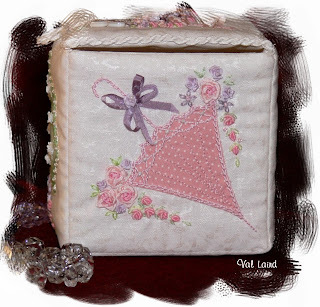 It is delightfully embellished with applique, stitching, quilting and charms. 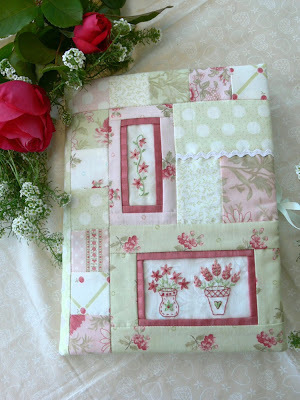 This pattern includes instructions for customizing the cover to fit your own machine. 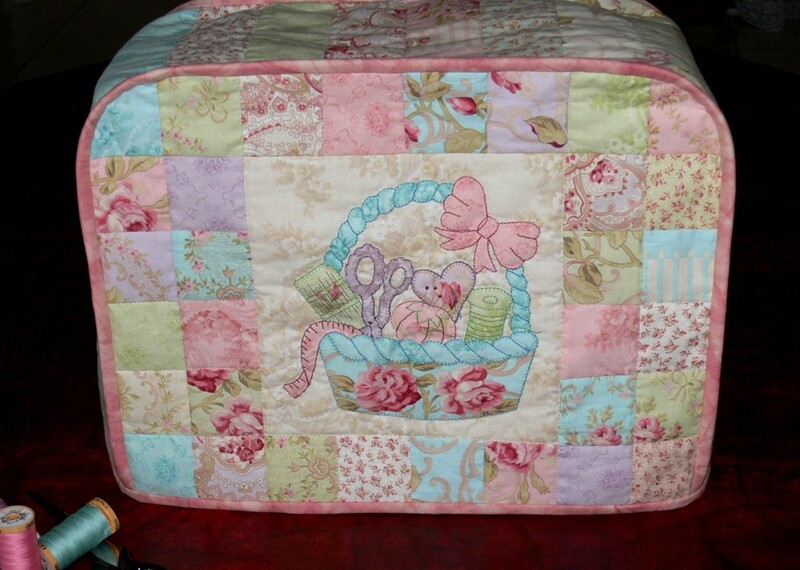 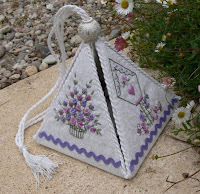 The front of the cover features a lovely sewing basket applique surrounded by pretty squares. 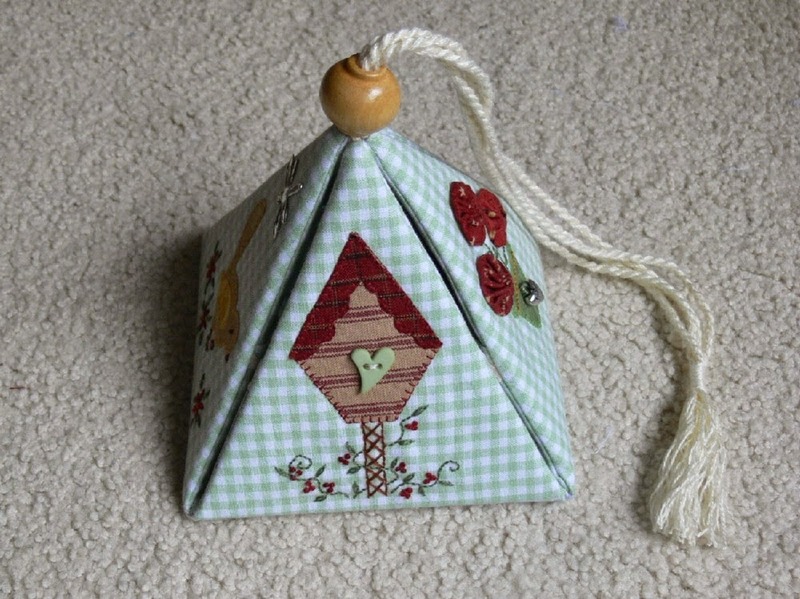 This design is an attractive and practical accessory to protect your valuable sewing machine. 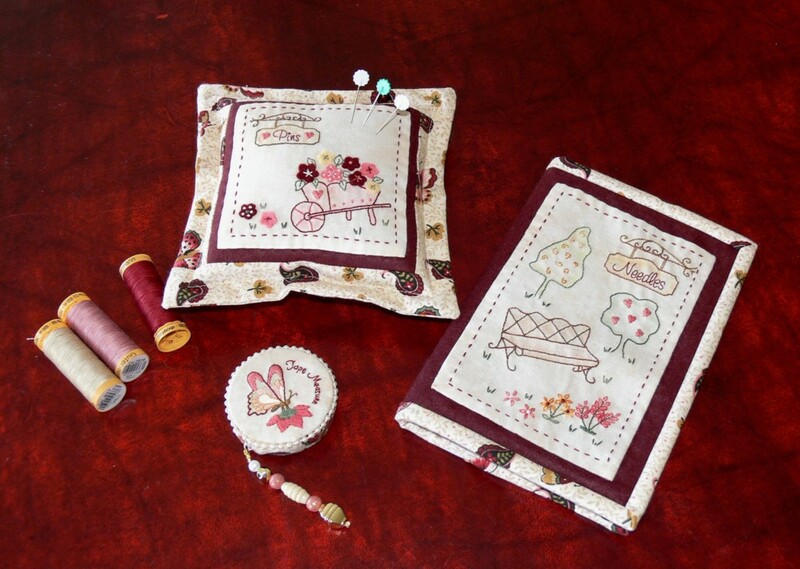 This delightful Etui (pronounced Ay-twee) is 13 x 13 x 13 cm (5 inches) and is ideal for carrying and storing your stitching necessities. It opens out to reveal pockets for your bits and pieces and a heart pincushion for pins and needles. 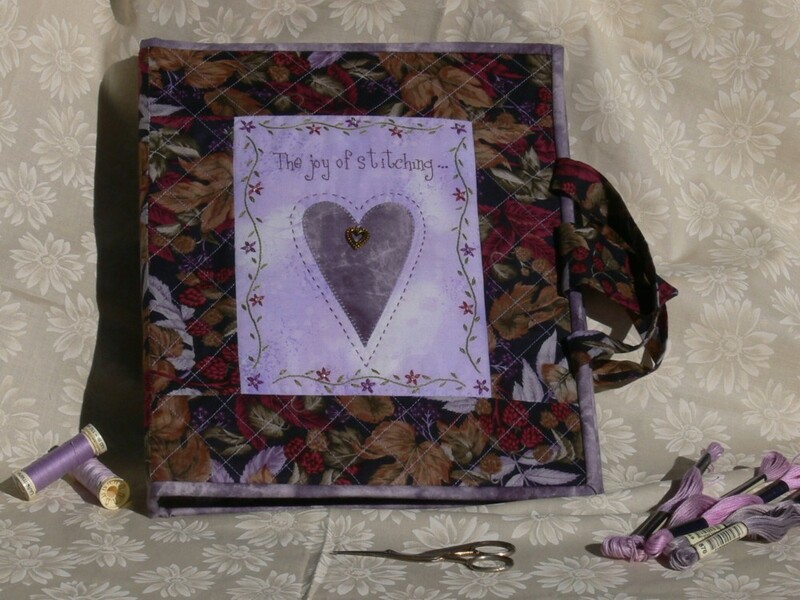 This pretty and practical sewing folder is an ideal way to store and carry your stitching necessities. Its closed size is 20 x 25 cm (8 x 10 inches) and it opens out to reveal lots of nooks and crannies for your sewing bits and pieces. Here is a pattern for some quick and pretty coat hanger covers. The pattern is sized for an adult hanger with instructions for altering the shape to fit your particular hanger. 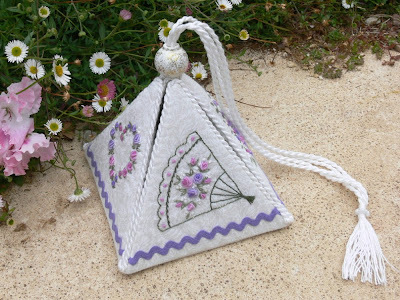 This pattern is ideal for making a gift, or for a fete stall. 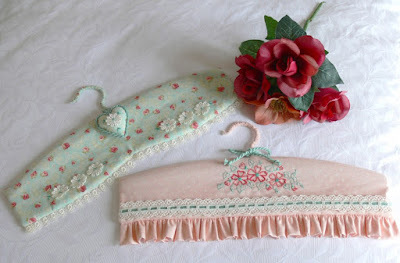 These two pretty coat hanger frocks would make an ideal gift. They are sized for an adult hanger - the green floral frock measuring 11½ cm (4½ inches) deep and the pink ruffled frock 13 cm (5 inches) deep. 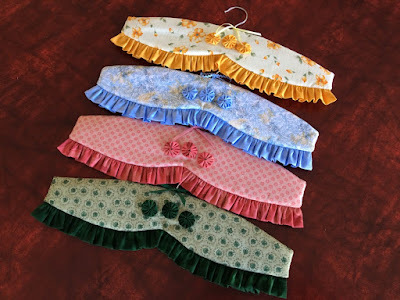 Instructions for both frocks are included with the pattern.